This is the story of Bronte, from our Church Knowle deputy centre manager's point of view as she spends time with this special boy helping him to overcome his fears. "Bronte came to us from a family that originally rescued him from Cyprus. He was feral and aged around 18 months when they found him. He was also suffering from a major eye infection. After an operation to remove his eye, Bronte lived with the family and adjusted well to home life, often sitting on their lap in the evening and curling up on the bed at night. Sadly, Bronte came to us after his family could no longer provide him with a home. Probably due to his colourful past Bronte struggled immensely in the cattery environment, in fact he is the worst case I have ever seen. He would sit in a corner, where we placed a box for him to hide in, tremble and dribble and lash out if anyone tried to touch him. This behaviour showed us how scared he was which was very sad to see. In order to get Bronte vaccinated and health checked he had to be taken to the vet which meant moving him around a little. Each time we had to move Bronte he would get in to such a panic he would scale the walls and even urinated himself on a few occasions. Usually after a few days of gentle reassurance and some yummy treats, timid cats will begin to relax and adjust to their new surroundings but after a couple of weeks it became apparent that this was not going to happen. We started a strict rehabilitation process which involved a tremendous amount of time and patience. This process started in our isolation cattery away from the hustle and bustle of excited adopters. To start with, we did not give Bronte regular meals in a bowl but instead we sat with him in silence with delicious treats like tuna and dreamies several times a day until temptation and a rumbly tummy would hopefully bring him forward. After the initial first paw forward, usually within 5 days, the progress tends to landslide as they realise quickly that not only are you not hurting them but they are getting delicious things from you. It is all about gaining trust. Bronte had been with us for 36 days when he started to make some progress, and almost took the food straight from my hand. I knew that Bronte would need to find a forever home with someone very special who can be patient with him and accept that he may always be a little bit of a worrier. On 10th February I started the process of sitting with Bronte for breakfast and tea, not feeding him unless he ate while I was there. I started this using very tasty treats to tempt him. Two days later we had a breakthrough as, for the first time, Bronte ate some of the treats I was flicking his way. He then also ate some meat and almost had the equivalent of a whole meal. Very exciting! From this point the process quickly improved from taking him 20 minutes to start eating to taking just one or two minutes. Each morning and evening I feed Bronte by flicking little pieces of meat in his direction (he is always hiding in his box). Each day is a little different, sometimes he will come half out of the box or almost all the way out and eat the meat as it drops from my fingers and sometimes he back steps a little and will only eat from the safety of his box." "I went in this morning and for no reason I can understand Bronte came out of his box the moment I sat down. He eagerly waited for me to scoop some food in to the bowl I had placed down. Then to my astonishment he climbed over the bowl, walked round my back and settled so he was sat beside me facing the same way I was and ate his breakfast side by side! At mid day I went to see Bronte again with some dreamies, he was quite happy to poke his head out and eat a few. He was padding the ground quite happily and waiting for me to place the next one in front of him. I placed one down and he came forward padding the ground, he was content and he sniffed my hand he then erupted with a hiss and sudden lash out swiping my hand with some force. He withdrew and lashed out a couple more times from his box, although after a minute he relaxed and had a couple more treats that I flicked near him so I left it at that." A week later, Hannah and Bronte were making great progress! "Well today was a leap forward! As I went in Bronte came out and greeted me with a couple of meows and he was purring and kneading the bench. He rubbed his face scenting around the boxes and was out of his box completely. I knelt down on the floor today so as not to invade his space and placed some food on the bench. He did not want this food so came to the shelf and hopped down to the floor. I fetched another tin of different food and came back and he was still quite happy to come out and hop on to the floor. He rubbed around my legs and as I put chunks of this meat on the floor he ate them. I went and fetched a bowl and put some of this meat in to it, Bronte happily sat on the shelf and devoured the lot!" "The last few days Bronte had improved a little each time, he is now on the floor meowing for his breakfast. He will still hiss if I move a little too fast but he is now encouraged by the sound of my voice. If I chat to him he will look at me and respond by rubbing round my legs. Today I stroked him for the first time. He sniffed my hand then pushed his head in to it, I didn’t move so as not to spook him but when he was eating I stroked his back and along his tail a couple of times which he seemed to enjoy. Only a few days after this, Bronte was still happy for me to stroke him and after what felt like an eternity of sniffing my hand he chose to rub against it rather than swipe it which was a relief! He also let me stroke his head and face and rolled on to his back and was purring a lot." 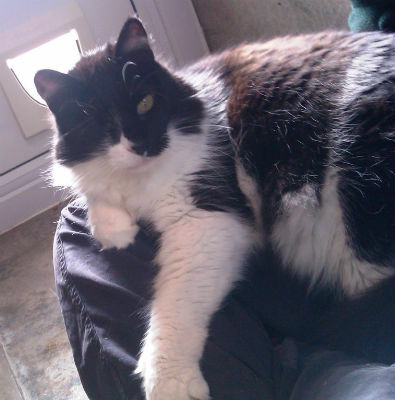 In March Bronte curled up on Hannah’s lap ­ a wonderful result! Hannah is still working with Bronte all the time and we are also introducing him to new people and two people at a time to help him with his rehabilitation. We would really like to find Bronte a forever home where he will gain more and more confidence. Given time and patience, Bronte is extremely loving but he does need to find a home as the only pet. We can only provide this special care for animals like Bronte with the help of our valued supporters. Please consider giving a gift today to help more animals like Bronte.